Our wide variety of puppy treats include small, tasty training treats as well as a beautiful range of puppy treats that can be personalised with your puppy's name! Our puppy treats include those fresh from our UK bakeries including Pooch's, Puredog, Innocent Hound, Hungry Hector, Alpha and Ruby's, Bertz and Barker's Dozen. Choose from a huge variety of flavours including beef, salmon, lamb, chicken and many more! Your new puppy has a lot to learn, whether its to pee outside, sit, stay, roll over, give paw… the list goes on and on but one thing remains the same which is that your puppy needs great quality puppy treats to aid training. 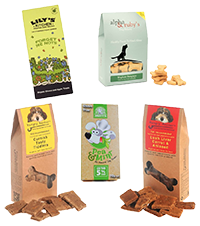 We have a great range of natural puppy treats by top bakeries Poochs and Hungry Hector and we also have some treats that can be personalised with your puppy’s name all freshly baked here in the UK by Bertz Pet Bakery.